It all began with Earth, Wind and Fire. Yes, the 70’s era band. When I was 8 years old, I was invited to a friend’s sleepover party. We were playing that game where everyone has an index card with the name of a famous someone or something taped to her back. The goal is to guess what’s on your back using hints from the other party guests. That something taped to my back freaked me out! My thoughts were a whirl, my negative critic was in full swing and my fears of failure and embarrassment were taking over. I knew I would never be able to guess correctly and I knew that I would be teased and ridiculed. I had to find a way out. I excused myself to go to the bathroom, turned around, looked in the mirror and read… Earth, Wind and Fire. And in that moment, I learned the powerful control of fear’s message: Avoid uncomfortable or potentially uncomfortable situations at all costs. I’ve heard from many of the parents I work with that they want their child to be happy and carefree and, like in my story above, they see worries (or other strong emotions) taking this away from their child. 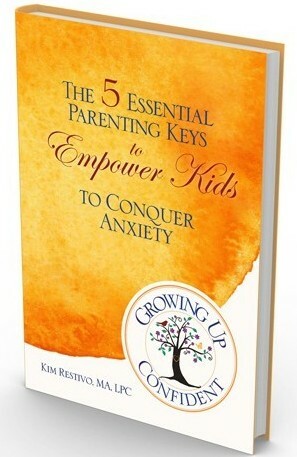 You can gain peace in knowing exactly what steps to take to guide your child through challenging emotions. If it has to do with kids and emotions, I can help. I’m Kim Restivo Lange, therapist and parent guide. After 5 years as an elementary special education teacher, I discovered that what I really love is helping kids with their emotions. I returned to school, earned my master’s degree and have been providing counseling to families for the past 18 years. In 2006, with much excitement, I opened my private practice specializing in counseling children and teens. My childhood experiences with anxiety gifted me with a unique perspective that I bring to helping your family. Not only do I have specialized education and many years of professional experience, I understand what it’s like to be a worried kid. I’m thrilled to share with you the gathering of my personal and professional experience so you can confidently navigate your child’s or teen’s big feelings with the peace of mind that you’re teaching them the emotional skills they’ll need throughout their life. Want to know more? Explore how we can work together here.